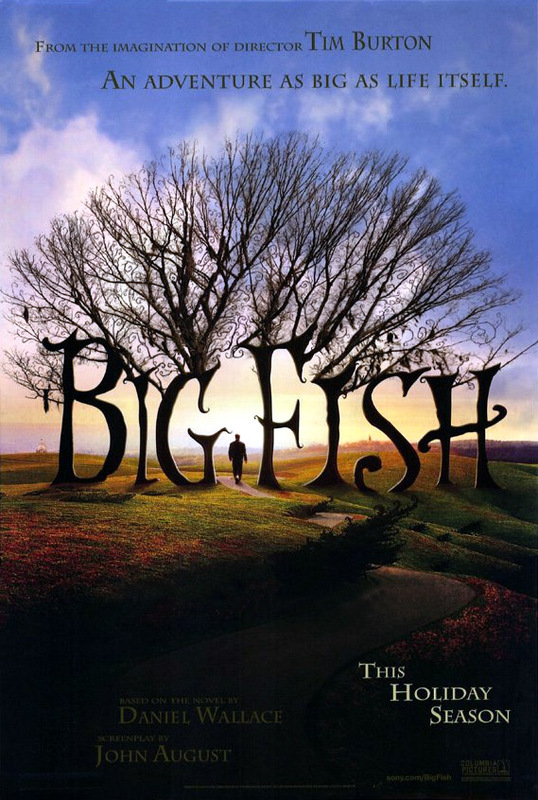 Big Fish is about a man named Ed Bloom who loves life and lives large. Somewhat larger than life, actually, the way he tells it. You see, he loves to tell stories and everyone love to hear them. Everyone but his son, that is. The stories always have this fantasitc aspect that makes Will Bloom, the son, feel like Ed never tells the truth. In fact, they haven’t spoken in 3 years, ever since his dad told one of his whoppers at Will’s wedding. Ed (in all his own stories) is a positively great guy. He wins the basketball game, the football game and the baseball game, rescues a child’s dog from a burning building, and saves the town from a giant—in one story. But the viewer, like Will, wonders how much is true, and how much is just Ed rattling on. Now Ed has cancer and Will and his pregnant wife make the trip to see him. Woven throughout the movie are the stories that Ed tells, realized exactly the way he tells them. There’s a witch with the power to tell you how you die, a massive twelve foot tall giant, a cozy Shangri La style town, and a huge fish story. Tim Burton does an excellent job with these kind of things, and this movie is no exception. All the locations and stories are skewed just a little from reality and give the movie and edge thats hard to define. Ewan McGregor plays Ed during these stories and he does a wonderful job. He is a completely believable Ed Bloom—happy go lucky, honest and upright. One interesting thing is that this tells the story of Ed’s life and so there are no less than three actors playing Ed at various stages of life (four if you count the baby Ed). Each actor does a nice job and they all fit in the movie rather cohesively. Actually most of the main characters have two actors playing them—young and old. In the end, the movie is really about a couple things. First, it’s a love story between young Ed and his bride to be Sandra. Second, it’s about Ed and his relationship with his son. Both of these strands (and all the various minor one’s too) are well thought out, well written, and well acted. This was a particularly moving movie to me. It is also helped by Danny Elfman’s score, which is very good. I don’t usually notice movie music, but I noticed this movie’s. This is one of Tim Burton’s better movies, and I think it’s one of the better movies I’ve seen in a long time.